The Jesus Prayer, one of the great treasures of Eastern Orthodoxy, is becoming increasingly known and valued in the West. Brother Ramon, an Anglican Franciscan hermit, and Simon Barrington-Ward, former Anglican Bishop of Coventry, received instruction in this form of prayer from Archimandrite Sophrony, one of the greatest of recent Orthodox teachers living in the West. In this delightful book, they pass on what they learned with great clarity and power, grounding their teaching in the Scriptures and adding insights and stories from the Western church and from around the world. The authors provide practical guidelines for how to practice the prayer, both indiviidually and corporately, and they relate the prayer to some of the most essential patterns of Christian discipleship. About "Praying the Jesus Prayer Together"
Ramon is an Anglican Franciscan friar who has worked as a pastor, priest, and university chaplain, and for the last 8 years has been living as a hermit. Simon Barrington-Ward was General Secretary of CMS (1975-1985), became Bishop of Coventry in 1985 and eventually retired to Cambridge. He travels widely, speaking on prayer and spirituality and the Jesus Prayer in particular. 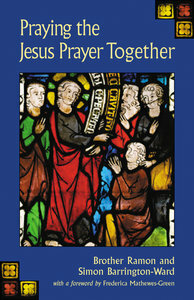 Through writing the original edition of The Jesus Prayer, he came to know Brother Ramon SSF and they collaborated on Praying the Jesus Prayer Together (BRF, 2001).